So you want a little more desktop real estate, eh? You could replace your existing screen with a bigger, higher resolution one, but sometimes a bigger monitor can just be, well, a little too big. You could always go with a secondary or tertiary monitor, but sometimes your desk is just too small. In that case a little USB auxiliary monitor is just right, and MIMO's latest, the 710-S and 720-S, are slimmer, sexier, and far more portable than ever. We thought that would make them perfect for anyone with a Goldilocks complex and slinky laptop, but the truth is, sadly, a little more complicated. When we got our hands on the first MIMO series to be released in the US, the UM-710, we rather liked the thing. 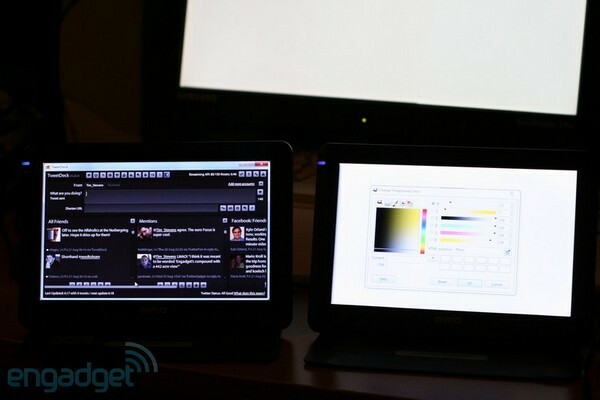 Its seven-inch, 800 x 480 screen was just the right size for playlists, digital palettes, chat windows, or anything else that just takes up a little bit of your desktop. And, its USB connectivity made it incredibly easy to add to just about anything with a USB port. The 710-S and 720-S share the same panel and same functionality, but are graced with a new folding stand that, when closed, makes it look like something a stylist might pull out of a makeup bag before reaching for a blush brush. When open the screen sits nicely either in portrait or landscape modes, but rather unfortunately its viewing angle cannot be adjusted. You can tilt it up or back to just about any position you like, but as soon as you let go the display slides back to where it wants to be, leaving it infinitely though only temporarily adjustable. MIMO's 720-S on the left, with the brighter 710-S on the right. In the older style there exists the base UM-710, the webcam and microphone-endowed UM-730, and the UM-740, which goes further still by adding a touchscreen. The slimmer S styles apparently don't have room for too much accountrement, as there are only two models now, with the higher-end 720-S adding a touchscreen. From the outside it looks exactly like the 710-S, but once powered on you can see the difference immediately. The addition of a touch-sensitive layer to the seven-inch screen has the unfortunate effect of degrading the image quality, similar to what a cheap, universal screen protector looks like. We turned down the lights for the above photo and you can clearly see the difference in brightness between the two (720 is on the left). Then we tried to use the thing. At first it simply didn't work, and after a little searching we realized a separate touchscreen driver is required. That driver is included only on the CD, not downloadable anywhere, so keep that disc somewhere safe. And, if you're using OSX, you'll need to pay a whopping $30 for the privilege of acquiring a compatible version, as only the Windows version is included for free. Installation is painless, but we'd rather flagellate ourselves with the included dual-USB cable than go through the configuration process again. The driver package is generic, unable to identify the MIMO, so it needs to be manually told which of your displays is the touchy one. Once suitably informed it pops up a calibration screen with four crosshairs to be tapped in order to set everything right. The problem here is that the calibration screen is too big; you can only see the first X, with the other three lost off to the right and bottom, displayed only in the minds of the developers who didn't give this software the simple ability to detect the resolution of the display it would run upon. After poring over the obscure options in the driver we did finally manage to calibrate the thing, tapping on the screen where we thought the crosshairs should have appeared, which gave us accuracy that was close but not perfect, meaning the mouse cursor always moved a few pixels from where we touched. That cursor is perhaps the biggest issue -- tapping is equivalent to moving the mouse and clicking, meaning that you can touch to bring the cursor over to the auxiliary screen to activate something there, but will always have to reach for the mouse to drag the cursor back to where it was. If we have to move the mouse at all we'd just as soon move it both ways. Sadly the touchscreen driver wasn't the only one causing problems. On released flavors of Windows we had no issues, but testing on our Windows 7 machines caused a number of problems. 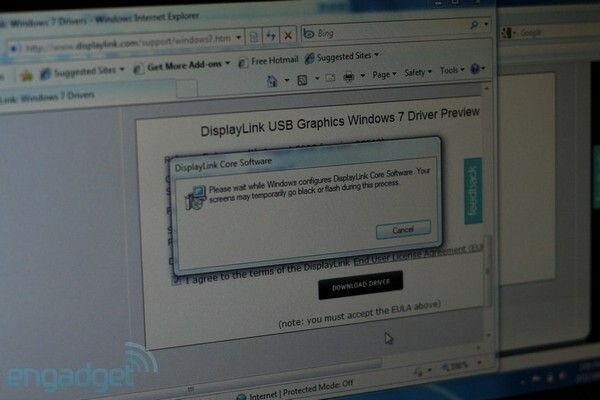 On an Eee 1000-series, which we were most eager to test this with, the Win 7 drivers simply wouldn't install. At one point the driver dialog tells you not to worry if your screen starts to flash. We, of course, worried, and sure enough about half-way through the Eee simply went dark and never came back again. Thankfully all was right after a reboot, but we never got the display working with it. On our Win 7 desktop we had more luck, getting the displays to work, but the driver immediately killed all gaming performance, somehow interfering with our GPU and causing 1fps throughput. On top of that windows started flashing and flickering unpredictably as soon as the drivers were installed -- problems that went away as soon as they were uninstalled again. It's not fair to criticize this driver too harshly yet, as it's still rated as alpha (though we were given access to the beta version and found it to be no better), but we're guessing many of you have already ditched Vista or XP and gone to Windows 7, despite it not being available at retail just yet. So, if that's what you're rocking, you'll want to wait for the full driver release before rolling with one of these. 720-S to the left of the 710-S. If either of these two pique your interest we'd highly recommend sticking with the cheaper 710-S. The touchability of the 720-S did nothing for us, nor did the decreased image quality, and at $80 more than the other ($149 vs. $229) it's simply not worth it. Whether the 710-S is worth it is, of course, up to you and your budget. It's a bit too pricey to pair with your average netbook, but could make a great travel companion for higher-end, slim laptops that are lacking in display space. For those not looking to take their external monitor along with them, stick with the older models. Their stands may be bulkier and they're not nearly as stylish looking, but they are at least marginally adjustable. Q: Is the $30 Mac OS X driver for both displays, or just the 720-S? A: It's $30 for the OS X touchscreen driver. Both monitors will work as non-touchscreen displays on OS X without purchasing any additional drivers. Q: How are the displays powered? A: Both receive power over USB. They include a dual-plug USB cable in case, for some reason, whatever device you plug them into does not provide enough juice over a single port. But, in our testing they worked fine without needing the auxiliary plug.